Whether you daydream about skiing with Tommy Moe, skiing like Tommy Moe, or even being Tommy Moe, your fantasy may come true on your next Alaska adventure at Tordrillo Mountain Lodge. Dream about following in Tommy’s tracks down friendly bowls or steep couloirs. Hope to discover his secret stashes and new runs in the Alaskan wilderness. Imagine a fireside chat sharing stories. Get a glimpse of what it is like to ski like an Olympian – or at least with one. Tapping his incredible skiing insight, Tommy Moe may just be there to guide you to his favorite stashes in the backcountry. Yes, dreams can come true! As a kid, Tommy Moe admits he daydreamed about skiing constantly and often played hooky on powder days. (He also admits that as a sever year old he struggled in the deep powder and had some terrific crashes!) This fun-loving skier fulfilled his dreams by racing to a gold medal in the downhill at the 1994 Winter Olympic Games in Lillehammer, Norway. Four days later, he celebrated his 24th birthday with a silver medal in the Super G. After the Olympics ended he earned his first World Cup gold with a victory at Whistler. Dreams do come true. 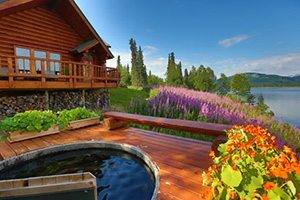 Thighs still burning (though the sauna, massage, and hot tub should help), body tired, mind exhilarated, and completely satiated, you can enjoy the midnight sun or the northern lights (depending on the time of the year). And then to sleep, where your dreams will not even begin to surpass real life.